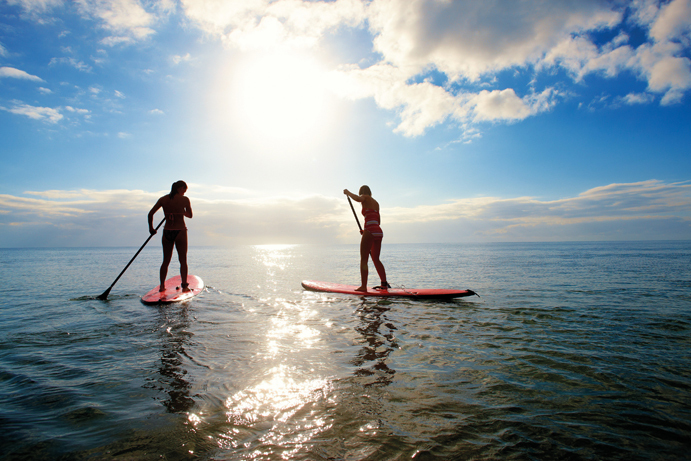 Stand-up paddle boarding, or SUPing, is a variation of surfing where the participant stands up on a long, wide surfing-style board and propels themselves through water using a long paddle. There are many variations of the sport, including flat water, rapid and ocean paddling, as well as paddle board yoga and even fishing. Stand up paddling in some form or another has been around for thousands of years. Modern SUPing became a popular variation to surfing in Hawaii in the 1940’s and was reported to be the most popular first-time recreational activity in America in 2013. Popularity of the sport has steadily increased in Australia over the last 5 years. It is more popular in coastal towns, but I think living so close to the Hume Weir here in Albury-Wodonga offers us all the perfect opportunity to jump on board! The benefits of SUPing are countless. You will be outdoors in the sunshine, restoring your vitamin D, getting your heartrate up and breathing in fresh air to improve your heart and lung health. Standing on the board requires a great deal of balance and can be challenging at first. The only way to improve your balance, is to practice! Paddling gives your upper body a good workout, but can aggravate old shoulder injuries if you start out too hard or have poor technique. Standing on a board whilst paddling will challenge your coordination and core strength, as you twist and turn to balance and stay afloat. Most of all, it is fun! In Australia, many surf schools now offer SUP lessons taught by accredited instructors. Unfortunately, we are far from the surf here on the boarder. If you are planning a coastal trip over the summer and are interested in some lessons, visit http://www.sup-australia.com. Alternatively, if you are confident on the water and would like to try something new, local watersports shops hire out stand-up paddle boards at a very reasonable price. Remember to be water safe, and if you would like to improve your strength, balance or coordination before hitting the water, discuss an appropriate strength and conditioning program with your physiotherapist.